Incertae Sedis is an exhibition that brings together works produced over the past 15 years by Paraíba-born artist, José Rufino. The title comes from the work of the same name that opens the exhibition, in which a twisted root grows out of an old wooden filing cabinet. Undefined even by the artist`s classification method, this odd vegetable sets the tone for what is to come. Letters from Areia series is a little older, its start dating back to the 1980s. It is made up of the purchase and sale documents for the old mill in the town of Areia, as well as travel journals and correspondence between the artist`s grandfather - after whom he was named - and his relatives. Rufino takes these and works on them with fine layers of paint and a few markings. Plasmatio is an installation that is marked by its sheer size and emotional weight. In it the artist puts together tables, writing desks, chairs and cases in the same space but in unusual positions. With the old furniture, Rufino creates a structure for his work and sets a course for the visitor. In the center there are two pillars of carefully piled-up tables that provide the frame for the image to take shape. Rufino clusters and glues together old manuscripts which he then paints and folds, using processes inspired by Rorschach plates1 to create a symmetrical, anthropomorphic form that is hard to decipher. The form has no face and its boundaries are blurred. The body is not present yet it is revealed by its shadow and the traces it leaves behind. Born to social activists and organizers of the Peasants League in Paraíba, north-eastern Brazil, Rufino spent a number of his childhood years in an atmosphere of secrecy. As the artist puts it, “there was something in the air,” a real yet intangible danger, at least to the young José Augusto (Rufino`s given names). 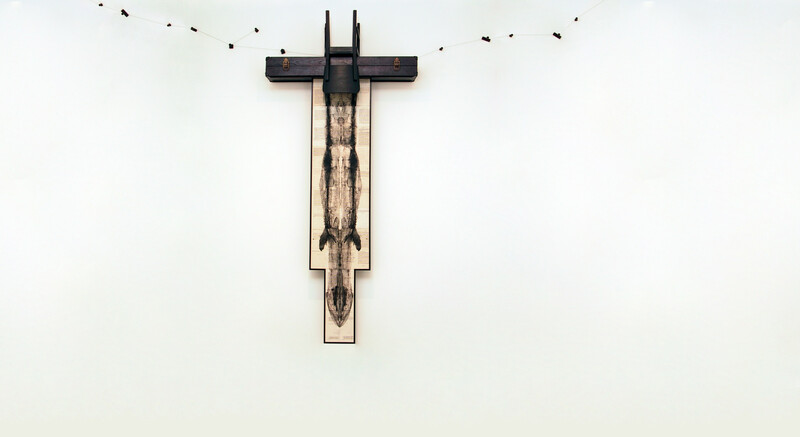 This striking aspect of his background, though common to many Brazilians, has given the artist`s work an investigative, almost archaeological feel in dealing with his childhood recollections. With this, an enticing quest is begun in the attempt to identify a body. Absence is translated into inexact reconstruction, an idealized image that is yet faceless and nameless. Letters to and from political prisoners and their kinsfolk, collected by the artist, serve as the starting point for a long, paradoxical process of deciphering and covering up manuscripts, which bears a certain resemblance to the methods adopted by their authors. This type of coded writing, which at the time served to put watchful eyes off the scent, is the central theme of Plasmatio. In its encoded correspondences conjure up memories of images, of safeguarded stories which Rufino collects and remakes along sometimes tortuous routes, like the interwoven threads that cross the hall and are tied to the stamps stuck to the wall. Further on, an upturned chair rests upon a long case suspended midair, suggesting a pause in time, memories broken, filed, undisclosed. Cases come up again in greater numbers in the installation Sudoratio, which concludes the exhibition. An odd, solid white substance seeps out of them, once again conjuring up the idea of memory and remnants in time. The white matter, which looks like a fungus but is quite unrecognizable, breaks seals and itself becomes a new specimen to be classified. There is something surreal in Rufino`s work. Parallels with the fantastical literature of Kafka, Cortázar and Sarama-go are inevitable especially when one considers the texts written by the artist that accompany this exhibition. Rufino`s flirtation with literature is self-evident from the very beginning: his first exhibition was of postal art. Ever since, writing has been more than merely present, it has become a central part of his journey. In this sense, ordering, deciphering, classifying, naming, though not necessarily in this order, are processes by which José Rufino creates a platform for new categories that awaken our curiosity, making him an artist of many named of almost every name. 1 Herman Rorschach (1884-1922), Swiss psychiatrist, developed a series of monotype plates - Rorschach inkblots - to measure people`s emotional and intellectual functions and integrity.